UPDATE *** you can see the tutorial for this here! I picked a fabric that ended up being back ordered. I decided to be patient and wait on the Riviera Red to be produced instead of choosing a different fabric. I am so happy that I waited because the stripes and colors of the Riviera Red are just yummy!! I could not be more pleased with the feel, quality, drape, and width of this fabric too. It is one of the most amazing fabric I’ve ever used. It is wide, and you could make a really big roman shade if you wanted. Or some really cool curtains, pillows, handbags, whatever you wanted. I really can’t say enough about the great quality of this fabric. The colors are true and the stripes are straight. 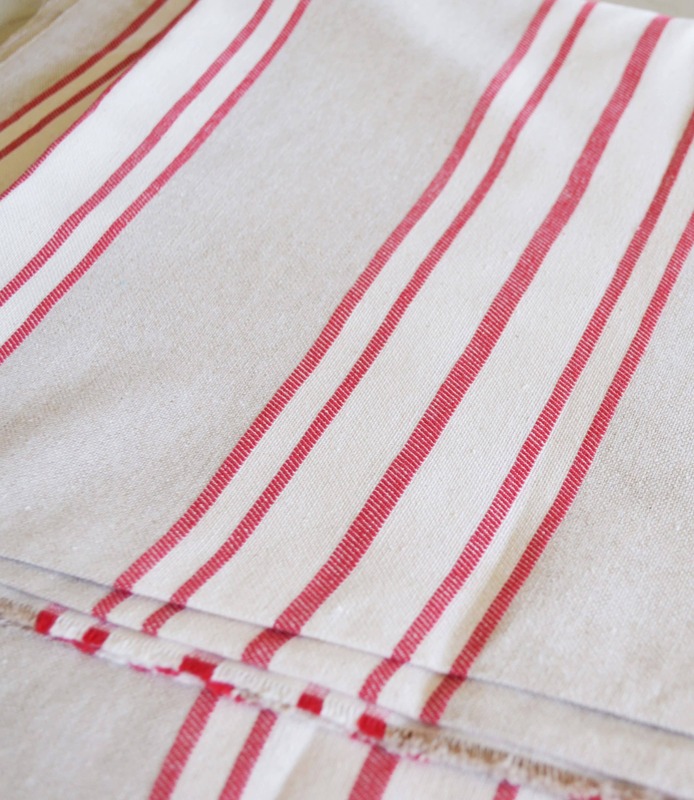 The Riviera Red is a light to medium weight fabric, not to0 light but not too heavy. I chose not to line the roman shade, so it is not completely light blocking. My kids can sleep half the morning with the window completely uncovered so I knew I didn’t need a complete light block, just something for privacy. Making it without lining was easier and faster, but if you wanted light blocking you would want to line it. Another reason I chose not to line it is because the window where the shade hangs is a North facing window so there is no direct sunlight hitting the curtain. If I were making shades for windows that got a lot of direct sunlight I would use a fade resistant lining to protect the fabric from fading and wear. 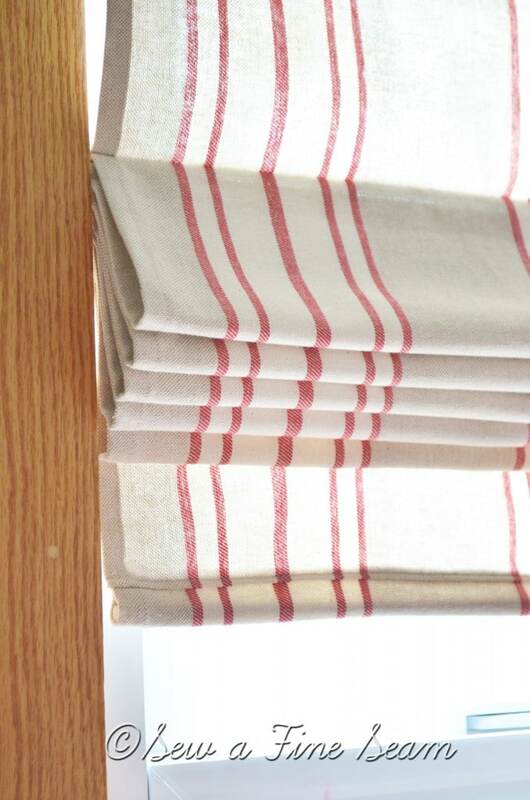 My first foray into the art of making roman shades was last summer, when I made several linen shades for a friend. You can see them here. We used a pattern she had, and used 3 long, vertical rows of rings on the back for the cords to run through for pulling the shade up. Because we used a drapey, linen fabric and did not use dowel rods to stiffen the shades, they hang in soft drapey folds. I love them in that style for the windows they adorn. When I annouced that I wanted to make a roman shade for my girls’ room, and my husband asked me to make it with the dowel rods in it so it would fold neat and even instead of soft and drapey. I’ve put together a little tutorial for you about how I made this roman shade, and I will share that next week. I didn’t really look online for a tutorial, I used the knowledge I gained from making the shades for my friend, and used a few of the techniques from the book Home Sewn by French General. Stay tuned for next week, and I’ll show you how I made this lovely roman shade. And no, it is not hard at all. If you can measure, fold, and sew straight lines you can make this! Using great fabric like Annie Sloan Unfolded® fabric only makes it easier! *I was given the fabric for this project in return for sharing my opinion about the fabric. All opinions are mine and are 100% true and accurate! I love this fabric and cannot wait to order some of the other prints. 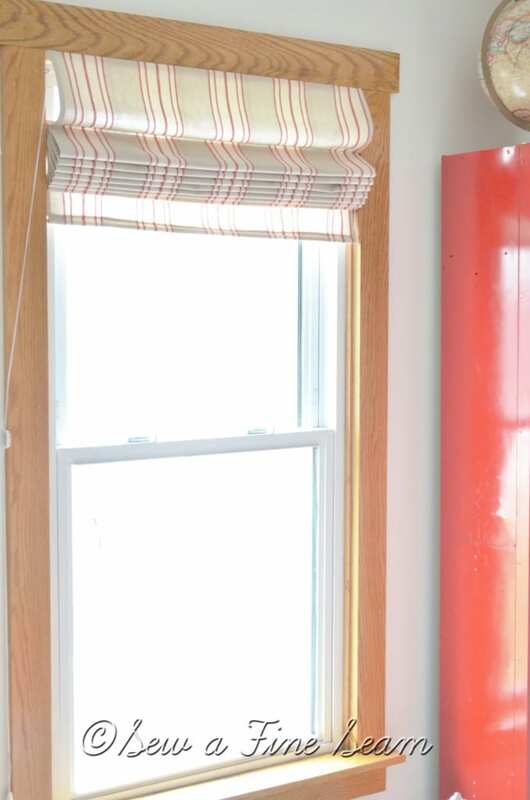 LOVE that fabric and your Roman shade is fabulous… and I think you were right to wait for the red stripe! Thank you Chris! I am really really happy with the way this Roman Shade turned out! That fabric is awesome and goes so well with your style! Love! it looks so good in that room and with the locker! I can measure, fold, and sew fairly straight lines, but I don’t know if I have the patience for such a project. 🙂 I do love Roman shades and this one is neater than any of my boughten ones! Another plus to making it yourself is choosing your fabric instead of being limited to whatever is available ready-made. I LOVE the fabric!! I am glad you waited too. Now I need to check out how you made those shades! Love the fabric and your shade!! I think they carry her line locally, so I will have to go check it out now!! I love that striped fabric! I think the roman shade you made with it is pefect for that room too. So cute. What a fun honor! The fabric looks beautiful and so do the shades!! You did Annie Sloan proud!! 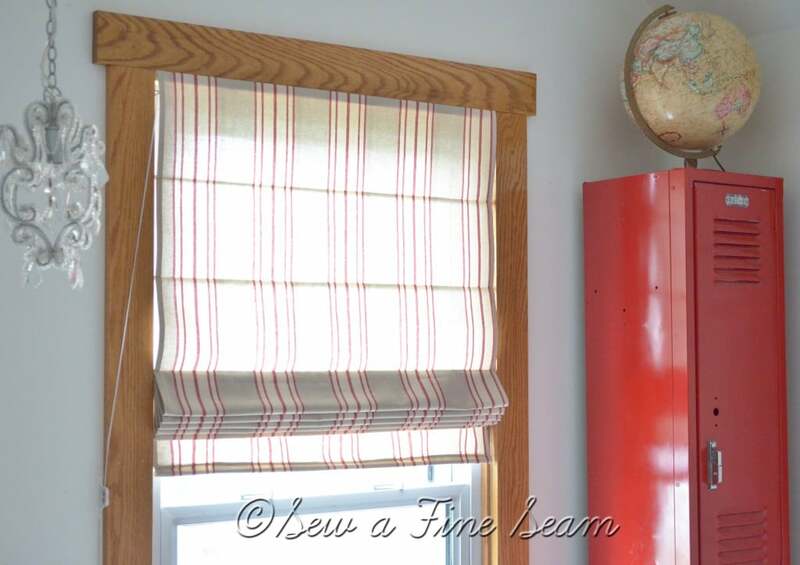 The fabric looks beautiful on your AMAZING Roman shade ~ can’t wait for the tutorial! Love a Roman shade. What a cute fabric for a shade. Love what you chose to make. It’s so sweet! Cute shade, Jill! Roman shades are one of my favorite! Thank you Crystal! 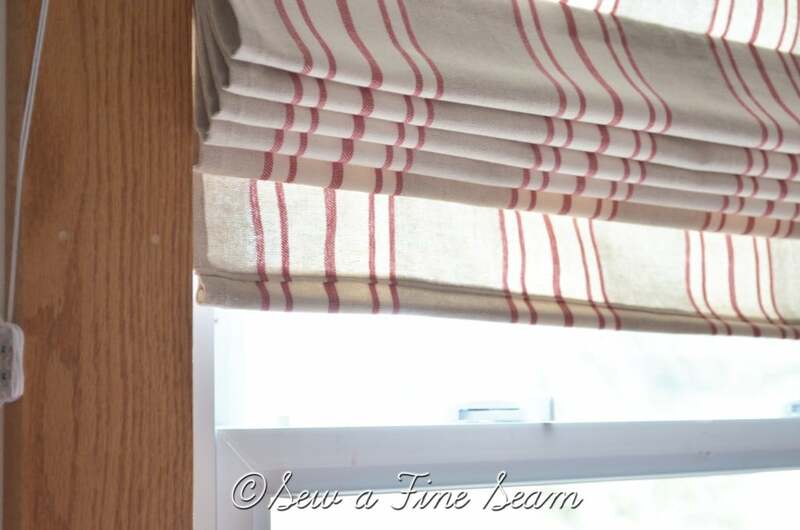 have you made any roman shades? they are super easy – way easier than they look! Lovely fabric and your shade looks really beautiful! 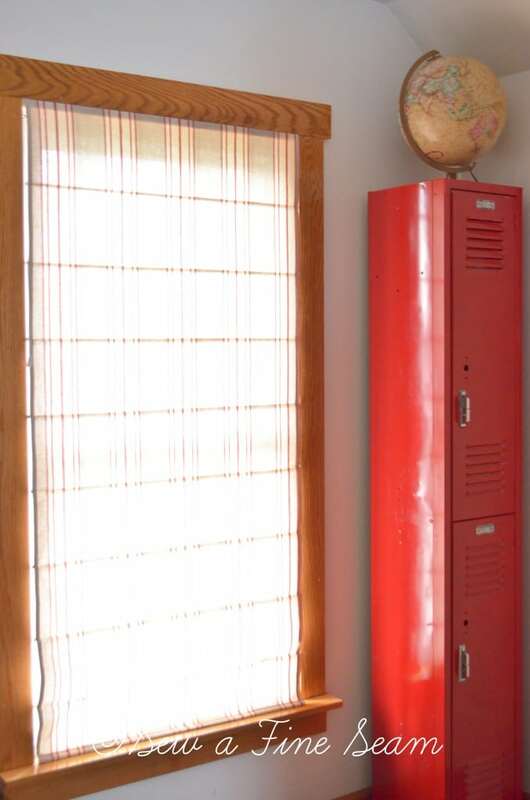 It looks so good next to your cool red locker! Love the fabric and your roman shade looks amazing! I love the fabric and the Roman shades. So excited for you in getting the opportunity to review their fabric. I love that the shades are soft and not stiff. They drape so prettily. Thanks for linking up at Transformed Tuesday. Lovely fabric and lovely shade, can’t wait for the tutorial! Love the peppy red and crisp folds. I have some vintage blue pillow ticking fabric from my hubby’s grandmother and I’m looking for projects. Pinning this. Thanks for the tutorial. I love the fabric you picked! I can almost feel the softness from your pictures. 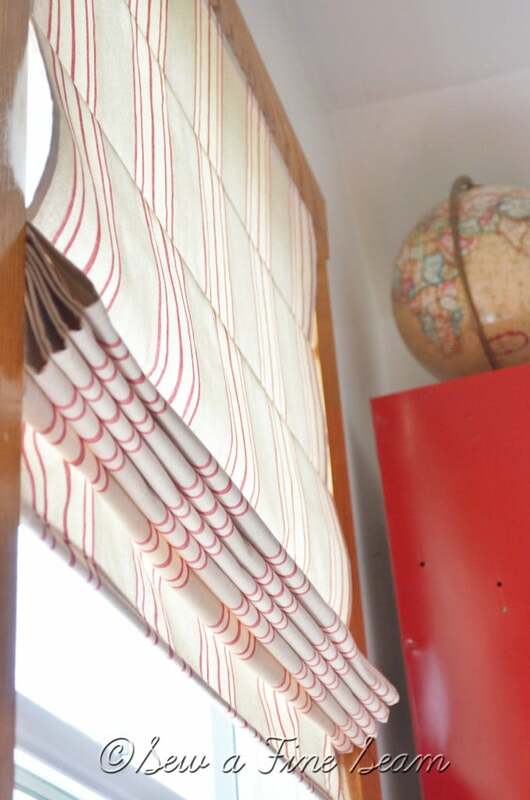 Can’t wait for the tutorial on the Roman shade….I’ve wanted to make my own for a long time! Have a lovely weekend! The fabric is gorgeous, but I totally love, love, love the roman shade you made. It is beautiful. I would love for you to link this to my Inspire Me party that is ongoing. Thanks Marty, I’m headed over there now! Gorgeous!! Thanks for linking up at Feathered Nest Friday! Thanks again Courtney! I already replied to you through email but now that I’m replying to everyone else on my blog I couldn’t leave you out! Fabulous as always! Stop by House on the Way tomorrow to see your shade featured!